The first post office in Sandusky opened in 1820 in a shanty on Water Street. Succeeding sites included various locations in downtown, most probably in stores, as was the custom. In 1857 a three-story stone building was built on the southwest corner of Columbus Avenue and Market Street to house the post office. A structure around the corner was purchased to board horses and wagons. For many years residents had to travel to the post office to collect their mail, but in December 1, 1882, Sandusky instituted free delivery. As the city grew, the needs of the post office did as well. 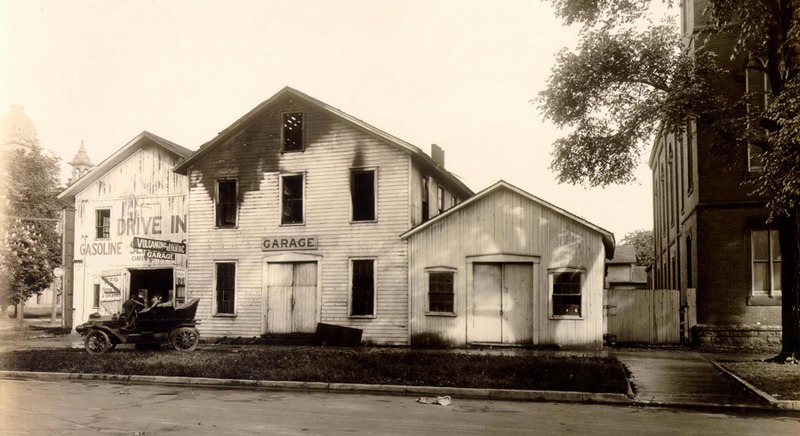 A new building was erected on the corner of Jackson Street and West Washington between 1925 and 1927. The structure sat on the highest point above sea level in Sandusky. 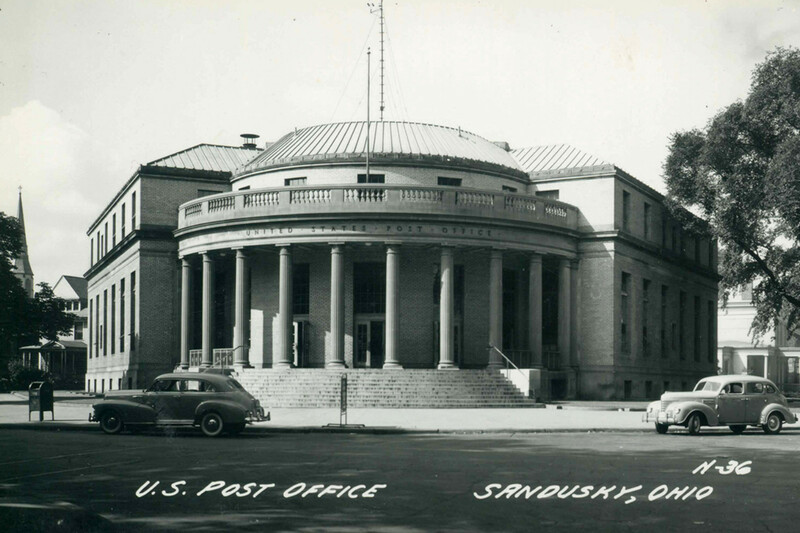 For sixty years the Jackson Street post office served as Sandusky’s business center, where merchants shipped and received goods and banks transferred money. During this time it also housed local offices for several federal agencies, including U.S. Customs, the National Weather Service, armed forces recruiting, and the Federal Bureau of Investigation. The U.S. Geological Survey disk embedded in the front steps serves as a benchmark for surveyors and scientists. Known for its impressive neoclassical style, the building sports a colossal portico that curves across the front and commands a view of Washington Park. Fluted columns support the porch roof, ornamented with a stone balustrade and a plain entablature. The buff brick building has an attic story and a parapet. Multi-paned high transoms surmount each of the three doors, which are trimmed with brass hardware. Outgrowing its space once again, the Sandusky Post Office moved from this site in 1986 to a new facility at 2220 Caldwell Street. 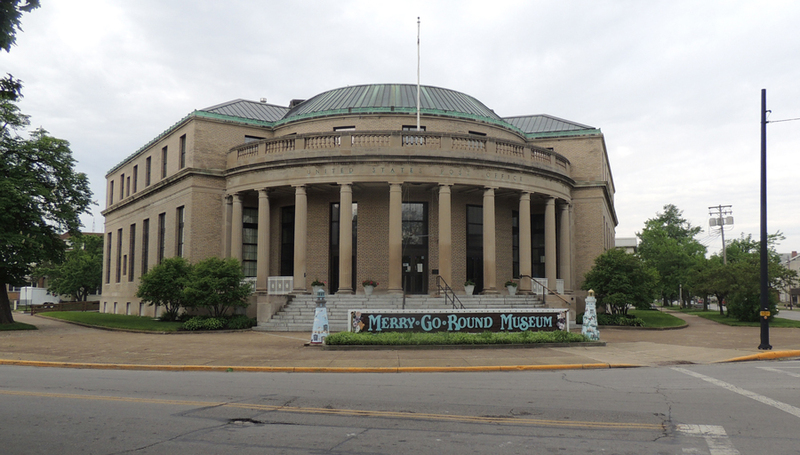 The building sat vacant until 1990, when the Merry-Go-Round Museum opened to the public on July 14. Two years earlier the U.S. Postal Service issued four carousel stamps, one of which featured the King Armored Horse from Cedar Point’s Kiddieland carousel. This particular King horse is considered to be one of the most rare and beautiful of all carousel figures. The first day issue ceremony was held at Cedar Point. In conjunction with the event a group of local citizens assembled a display of carousel figures at the former post office. More than 2,000 people from across the nation visited the display, which prompted the group of local citizens to form a non-profit organization with the mission “to preserve and promote the art and history of the carousel.” The organization purchased the former post office building, which is on the National Register of Historic Places and preserving the building became part of the mission. The Merry-Go-Round Museum displays artifacts that add to the public’s awareness, knowledge, and appreciation of the history of the carousel. Dentzel carving shop tools are a permanent exhibit, along with a working woodcarving shop, and a carousel machine, (circa 1939 Allan Herschell Corporation). The museum continues to seek artifacts from amusement parks, carnivals, and private individuals, and encourages long and short-term loans of memorabilia and antiques from earlier periods of the amusement and carousel industry. An historic marker was placed at this site in 2001.